APRIL Eye was developed as part of a Tesco led imitative to eliminate food waste in the supply chain. The artificial intelligence technology stops the wrong date codes being applied to products, stopping product recalls in the supply chain. The winner of the award will be announced on Thursday 18th October 2018 at the Double Tree Hilton, Coventry. OAL is the market-leader for label and date code verification systems and are experts at ensuring your product is in the right pack with the right date code. Our systems and engineers protect over 1,200 packaging lines everyday. APRIL Eye uses artificial intelligence to provide an extra layer of protection for food manufacturers. Our traditional systems ensure the product is in the right pack with the right date code by removing human error and proactively controlling devices such as printers on the line. APRIL Eye closes the loop by taking a picture of the pack and reading back the date code, just like a human, to ensure the correct date code is printed on the pack. It’s just like a human but without the errors caused by distraction and boredom. For most UK food manufacturers, installing APRIL Eye is their first use of artificial intelligence in their factory. It's a stepping stone for both OAL and the industry in the application of powerful digital technologies in food manufacturing. APRIL Eye uses the very latest advances in Artificial Intelligence to enable the machine reading (close to the performance of the human eye) of date codes either offline on any device capable of taking a medium resolution image, for instance, hand scanner, phone, iPad etc. or from online high-speed image capture devices. How does APRIL Eye work? Click to Expand - How APRIL Eye works? 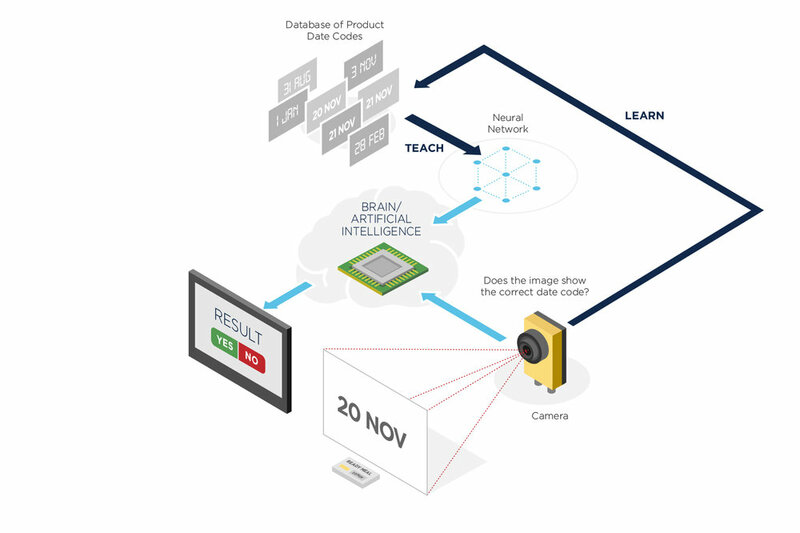 APRIL Eye combines traditional machine vision with artificial intelligence, creating a system that can read date codes as well as the human eye. Working with computer scientists at the University of Lincoln APRIL Eye the system was developed using machine learning and neural networks. In a nutshell, the machine self learns. In other words, the neural network discover the underlying patterns in classes of images. So, with end-to-end learning we no longer have to manually decide which traditional computer vision techniques to use to describe features. The machine works this all out for us. If you want to teach a deep neural network to recognise a cat, you don’t tell it to look for ears, fur, tail and eyes. If you did, the machine would not recognise the cat on the right below because it only has one ear. By showing the machine thousands and thousands of photos of cats, eventually it works things out. If it keeps misclassifying foxes as cats, you don’t rewrite the code. You correct the errors and feed them back to the learning process, i.e. learn from the mistakes. OAL have applied these principles to reading date codes. What impact will APRIL Eye have on the industry? Installing APRIL Eye creates a more robust and reliable supply chain, improves product quality and consistency and reduces wastage caused by label and packaging errors. This will help to reduce the c£60million - £80million food waste problem for the food manufacturing industry. “It is exciting to be working on the APRIL Eye project with OAL and the University of Lincoln especially due to the positive impact it has on the food manufacturing industry. The complexity of the artificial intelligence based technology behind what is such a simple and easy solution to roll-out and use is truly ground-breaking”. To find out more about APRIL Eye technology, click below.